Artist-designer Ella Varvio works with ceramics, comics and illustration, but glass is her main medium. She specializes in the Graal technique that was developed in Sweden hundred years ago. With the Graal technique, the glass is blown twice, allowing illustrations to be trapped between layers of glass. The images are made by engraving, painting or silkscreen print and then covered in molten glass. “I find glass functions as an extension of the illustration. A drawing is always on a flat surface, it’s inspiring to explore how glass can turn something two-dimensional into three-dimensional.” When light is projected through the engraved glass objects, the carved parts create reflections on the surrounding surfaces. For her works, Varvio finds inspiration especially from comic art and narrative illustration. Underwater subjects and plants are typical for Graal technique due to effects like air bubbles and foam purposely added in the glassblowing process. During her two-month residency, Varvio will be teaching a weekly class in Graal technique at UrbanGlass, a glassmaking studio that fosters experimentation and critical understanding of glass as a creative medium. Varvio, together with glassblower Joshua Raiffe, will focus on combining glassblowing and storytelling in their course. The classes run from May 10 – June 14. 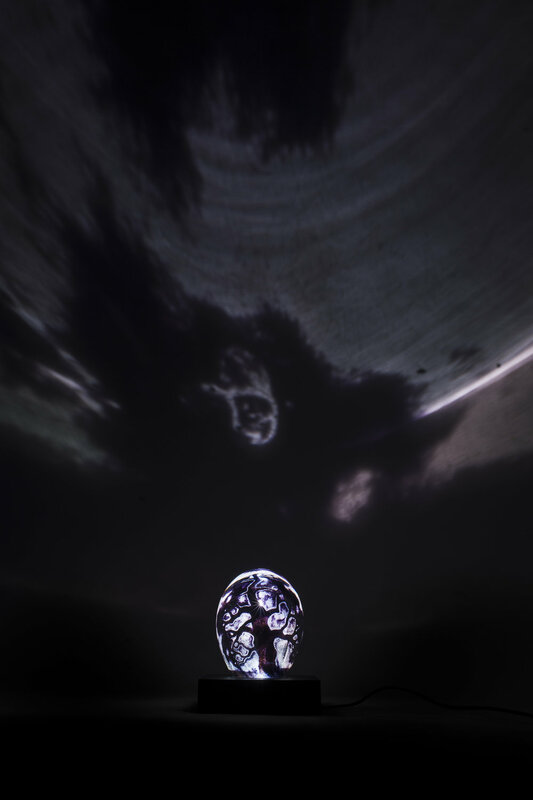 Varvio will have her first solo exhibition, focusing on her journey exploring the variations of the Graal technique, at the Finnish Glass Museum in fall 2018. Ella Varvio, Nemeton, 2017. Photo by: Iiro Immonen. Ella Varvio, Hanging Tree, 2015. Photo by: Iiro Immonen.